We invite you to explore India - the Land with infinite beauty ! Whether you soar high into Himalayas or peer under the ruins of the Ancient monuments dotting the landscape of India, you will cherish the experience long after your visit ! This India Travel Guide on St. George Basilica Angamaly is free from any commercial interest! This site is dedicated to promote India - the vast subcontinent, its glorious past, magnificent landscape and its infinite variety. Angamaly, a town in Kerala has been the cluster point of Christianity in India since ancient times. St. George Basilica of Angamaly is the largest basilica in South India with a built up area of 24000 sq. ft. It has enough space to seat about 8000 people at once and has been the principal place of worship for all the Christians. The church has a huge parish hall built underground normally used to conduct weddings. According to the existing records, the first church of Angamaly was dedicated to Saint George in the year 450 AD and this was the principal church for St.Thomas Christians. This particular sect of Christians were converted by St.Thomas - the doubting Thomas who was martyred near Little Mount in Madras. Jacobites and the Roman Catholics continued to worship in this church for hundreds of years till 1750. Angamaly in Malabar (a term which covered major parts of Kerala) was once the seat of Archbishop of the Syrian Churches until the arrival of the Portuguese who brought it under the Archdiocese of Goa in 16th century. Later on Ernakulam came into its own diocese and finally Pope Pius XI, raised the Ernakulam diocese to that of Arch Diocese in 1923. In the year 1992, the Venerable Pope John Paul II declared this as a Major Archiepiscopal church and the Archdiocese name was changed to Ernakulam - Angamaly in consonance with the rich historical perspective. His Excellency, Vicar, Very Rev. Fr. Paul Kariyatty actuated the building of the new St. George church. Cardinal Mar Varkey Vithayathil laid the foundation stone on 16th November, 1997 and the Church was consecrated on 31st December, 2006. It has aroused interest amongst visitors not only for its religious services, but also for its massive structure and the breathtaking architecture. The main altar stretching over 2000 sq ft roofed with a dome of about 185 ft is exquisite. Crucified Christ along with St. Mary and St. John and an array of grand and solemn statues of holy men are placed in the Main altar. The windows of the dome bear portraits of Apostles and pictures of the holy men and instances from the new and old testaments are imprinted on the other windows of the church. St. George Church was raised to the status of a basilica by Pope Benedict XVI. On August 10th 2009, the head of the Syro-Malabar Church, Major Archbishop Mar Varkey Cardinal Vithayathil declared the church a basilica. 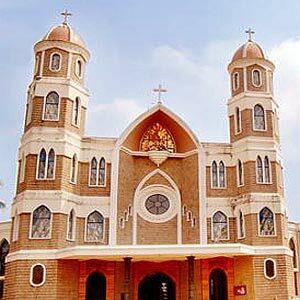 This is the third church to be declared as basilica after the St. Mary’s Basilica, Ernakulam, and the Shrine Basilica of Our Lady of Dolores, Thrissur. St. George’s Forane Church was elevated as basilica for its historical significance and contribution it made towards spiritual progress and development of Christianity. Puthunjayar perunnal - is the annual festival celebrated in honor of the Patron Saint St. George. Saint George was the Roman Soldier venerated by many Christian dispensation - Catholic, Anglican and Orthodox. He has pride of place as one of the fourteen holy helpers. St.George is usually depicted with Roman Soldier's gears slaying a dragon while mounted in a white horse. St.George is often invoked to protect against snakes and Angamaly - once rich with tropical rain forest which had its share of venomous snakes. The first Sunday/Monday after Easter is celebrated as the feast of St.George with much fanfare. The Puthunjayar Perunnal attracts devotees from nearby regions who offer models of Snakes, Eggs and statuettes of St.George Saint and others made of gold and silver. The basilica has perpetual adoration center located on the eastern side of the church. This was previously an old St George church which was renovated and modified to accommodate adoration center. The Perpetual Adoration Center was blessed on March 1st, 2009.